and Leadership Development through hands-on, non-threatening art activities. This retreat experience involves a full day of engaging studios activity in a relaxing and creative atmosphere with professional instructors guiding you throughout the day. Schuler Arts staff will lead you through several artistic learning processes designed specificly for your groups special interest and purpose. 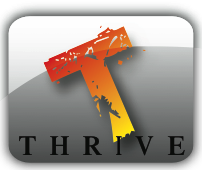 Thrive Workshops usually begin at 9:00 AM and conclude at 5:00 PM but can be adjusted to accommodate your needs. A tasty meal is served for lunch with snacks and dirinks availabe throught the day. You many also bring your own muncies, as well. 8:30-9:00--Arrival / Art Mingle---coffee, Juice, donnuts and fruit.